I can only laugh when my co-workers talk about having a pedicure. I simply can’t imagine paying anyone to pamper my tootsies when I have an obvious shortage of, well, toenails. Now perhaps if they didn’t charge per foot but per nail, I might be tempted. 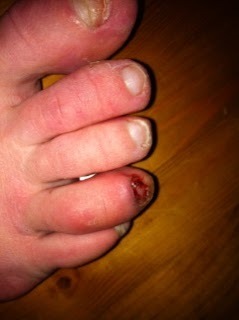 On Tuesday night, almost 24 hours after having the fourth toenail removed, it was still bleeding a bit. However, it didn’t hurt and I took that as a good sign. In fact, I was able to comfortably ride for 60 minutes on my windtrainer; if I could keep my feet in a stiff, narrow shoe for that long, I figured that recovery was going to be quick. Tonight, Thursday night, my foot looks the same – except that the blood is now dried blood. There is no pain, though, and I was able to run for an hour last night. I’m quite confident that this will be healed enough that I won’t end up with another blood-red shoe when my run is over. Tonight, while packing for Boston, I – well, Skipper – put together a first aid kit for the car: bandaids, gauze, tape, Tylenol, ice packs… You name and Skipper thought of it. This is the kind of toe pampering that I appreciate, the kind that you can only get with love. p.s. For those who want to track me in Boston, my bib is 15315 (Oh, the pressure!). Or you can follow my fanpage on FB by clicking on the FB badge. Toe nails just get in the way, don't they? !